Technology expert Scott Steinberg recently spoke with NewsWatch about some of the most innovative technology products of 2012. One product that really caught his eye came from a company thats been in the professional world for quite some time now. The company is called Toon Boom Animation Inc., and although consumers might have never heard their name, theyve been behind the scenes with some of Americas top entertainment companies such as Disney, Warner Brothers, Cartoon Network, Fox and Dreamworks pictures. Theyre digital content creation software and technology has been nominated twice for Oscars. With their entertainment industry knowledge, theyve been able to create a fun line of consumer-oriented animation products. They have a whole lineup of user-friendly applications for all ages, and all of it is based upon their years of professional animation technology. The one application that really stood out to Scott was the Flip-Boom Doodle. 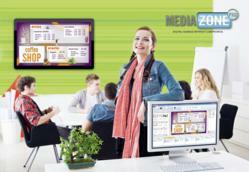 It allows users to create fun, animated videos using Flip Booms drawing tools and easy-to-use templates. 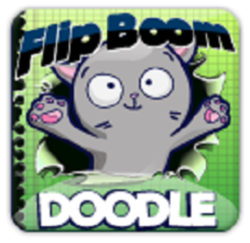 Flip Boom Doodle provides the tools for any child or novice artist to turn stationery images into fun and exciting animated clips. Consumers dont need to be a master artist or a technology guru, all the tools are right there for them, and there are a number of template pictures and images to help anyone create the perfect animation story in just a few minutes. Hailed as a top voice for todays high-tech generation by dozens of publications from USA Today to Forbes and NPR, Scott Steinberg has covered the field for 400+ outlets from The New York Times to Entertainment Weekly and Wired. A frequent on-air technology analyst for major TV networks including ABC, CBS, FOX, NBC and CNN, Scotts also a bestselling author and creator of the The Modern Parents Guide and Business Expert’s Guidebook series. More than one billion people have turned to his columns and reports for insight into all things high-tech. He is the CEO of TechSavvy Global. This entry was posted in Which Open Source Blog and tagged Artists, Aspiring, Children, Innovative, Products, Technology on March 6, 2013 by Administrator. The Internet of Things is getting closer to being an everyday reality, thanks to the team at Rowdy Robot. 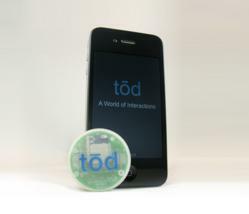 Soon, consumers will be able to use the companys small rounded disksknown as a td Smart Beacon (pronounced toad)to connect real-world objects and events to the Internet and even offline using their smartphones and other mobile devices. Using td Smart Beacons and their smartphones, consumers will be able to find their car in a crowded parking lot, know the exact whereabouts of their children or pets, create triggers and customized alerts when they are in range of their home, office or favorite storeand dozens of other practical applications. Were bringing the power of the Internet of Things to consumers pockets and into the real world, even in places where there is no Internet access, said CEO Jonathan Prevo. Td is asking tech enthusiasts to help the company accelerate its launch with a funding campaign on the popular crowd funding website Kickstarter. They have already reached 80% of their $ 50,000 funding goal, but expect to raise much more. The team at Rowdy Robot plans to ship the first devices in October 2012. Developers will have early beta access to the hardware in July. The td Smart Beacons have already made popular technology news, with coverage on Mashable, Endgadget and Geeky Gadgets. This entry was posted in Which Open Source Blog and tagged Bluetooth, Brings, Closer, Internet, Reality, Robot, Rowdy, Startup, Technology, Things on February 28, 2013 by Administrator. Clearwater Compliance, a leading HIPAA-HITECH compliance consultancy, today announced the signing of its first partner since introducing its expanded Reseller program earlier this month. Focused on providing real-world quality technology solutions to their customers, Three Pillars Technology Solutions, LLC, based in Madison, Wisconsin, will make Clearwaters HIPAA and HITECH compliance software and solutions available to its clients as part of their Security and Compliance service offerings. Through this partnership and the availability of Clearwaters comprehensive security and privacy products, well be able to expand the scope of our technology and compliance consulting business in the health care industry by offering our clients a credible, high quality compliance tool and resource that they can trust and rely upon. By offering our clients options and an alternative to the time and expense of building their own compliance tools, were helping to meet the needs of current and prospective clients, building stronger relationships and creating more opportunity to generate revenue instantaneously, said Jeff Grady, Director of Operations for Three Pillars Technology Solutions LLC. Clearwaters proprietary HIPAA-HITECH Software-as-a-Service (SaaS) platform is the first of its kind, leading the market in providing cost-effective, easy-to-use tools to help organizations that handle protected health information meet the stringent privacy and security requirements under the HIPAA-HITECH regulations. In addition to this platform, Clearwater offers related HIPAA Privacy, Security and Breach Notification policy and procedure templates, contract templates, workshops, end user education programs and managed compliance services. According to Bob Chaput, founder and CEO of Clearwater, Three Pillars possesses all the qualifications we want a partner in our Reseller Program to have. Focused on delivering a broad range of technology services with integrity, they develop and maintain deep, trusting relationships with their clients. Our service platform will provide the needed tools to enable them to support the specialized and complex requirements of HIPAA and HITECH compliance cost-effectively. We are delighted they have chosen Clearwater. Healthcare organizations have more reason than ever before to be concerned about their compliance with HIPAA and HITECH, Bob added. There are carrotssuch as the Meaningful Use incentives for EHR implementationsas well as stickswith the increase in audits, enforcement and penalties for non-compliance. It is our sincere desire to expand the distribution of our robust tools through partnerships such as this one with Three Pillars to reach the more than 4 million healthcare organizations that can benefit from them as efforts to secure the healthcare data for all Americans step up to meet the demand. Clearwater Compliance helps Covered Entities, Business Associates and their Subcontractors assess their HIPAA-HITECH compliance programs, identify gaps and prioritize remediation efforts to ensure the greatest return on capital and resource investments. It delivers that return on compliance investment through education, tools and software, risk management solutions and professional services and consulting. Since 2003, Clearwater Compliance has delivered thought, methodology, software and service leadership to the healthcare industry. As an example, Clearwater Compliance is the Co-Sponsor of the American National Standards Institute Publication of the Report on The Financial Impact of Breached Protected Health Information: A Business Case for Enhanced PHI Security. For more information, visit: http://ANSI.org/PHI. We have a simple goal at Three Pillars Technology, we strive to provide real-world quality solutions to our clients and to deliver our services with integrity. We want to help you operate smarter and better by working with you to determine which solutions and technologies best meet your business needs and improve business efficiencies and productivity. The principal founders of Three Pillars Technology have decades of experience and have had the opportunity to observe the evolution of information technology and technologys impact upon the business world. Not more than you need, not less than you require, but a solution that is just right. Thats our promise and commitment to you. This entry was posted in Which Open Source Blog and tagged Announces, Clearwater, Compliance, Joins, Pillars, Program, Reseller, Solutions, Technology, Three on February 22, 2013 by Administrator. Keywest Technology announced today a new three-tier discount pricing package to allow its existing digital signage customers to upgrade to its newest digital signage technology for up to 56 percent off the regular retail price. Keywest Technology has a long history of building great relationships with our customers, said company president Nick Nichols. We believe our new upgrade pricing structure carries on in that tradition by delivering outstanding digital signage performance with our highly acclaimed MediaZone Pro solutions at remarkable discounts. The MediaZone Pro discounts available exclusively on the MediaZonePro.com microsite reward Keywest Technology customers for their loyalty and give them the opportunity to select from the Basic, Basic Plus and Premium upgrade pricing. Basic upgrade pricing offers a 38 percent discount on MediaZone Pro software for users of legacy versions of the software. Current customers with a TotalCARE software maintenance program may qualify for the Basic upgrade for free. The Basic Plus upgrade pricing offers a 40 percent discount on a package that includes the MediaZone Pro software, free installation assistance for 30 days, one hour of one-on-one training and one year of TotalCARE software support and maintenance. Customers who have purchased any legacy Keywest Technology MediaZone, MediaXtreme or MediaPOD beginning in 2002 can take advantage of the companys Premium upgrade package, a 56 percent discount on the MediaZone Pro turnkey package. To qualify, customers must have a valid serial number for a legitimate Keywest Technology digital signage product. However, the product does not need to be returned, nor does it need to be in working order to qualify for the premium upgrade. The Premium level discount is available on a package that includes a turnkey MediaZone Pro digital signage player (hardware and software), one hour of one-on-one training and one year of TotalCARE software support and maintenance. This entry was posted in Which Open Source Blog and tagged 2002., Announces, Back, Customers, Digital, Existing, Keywest, Offer, Signage, Technology, Unprecedented, Upgrade on February 16, 2013 by Administrator. Xpriori, a leading provider of eDiscovery products and Technology Assisted Review services for law firms and corporations, is hosting two complimentary hands-on seminars on Wednesday, June 27, 2012 in Denver. The morning and afternoon seminars will feature live demonstrations, along with practical applications of the OrcaTec Document Decisioning Suite. The presentations are intended to provide attorneys, corporate counsel and eDiscovery professionals with the information and knowledge they need to responsibly rely on Technology Assisted Review with Predictive Coding. Technology Assisted Review has been proven to be more accurate and effective than manual review, while reducing costs by an order of magnitude . Experts Tim Dix, attorney and CEO of Xpriori, Dr. Herb Roitblat, pioneer and inventor, and Tom Haskins, a client and director at Silver & DeBoskey, will present and provide demonstrations of the OrcaTec Document Decisioning Suite. Their experience includes using the technology in recent and current court cases. Xpriori is a partner of OrcaTec and value-added reseller of its OrcaTec Document Decisioning Suite. The suite includes predictive coding, concept search and clustering features, with no extraordinary training costs and time required. This entry was posted in Which Open Source Blog and tagged Assisted, Denver, Hosts, June, Review, Seminars, Technology, Xpriori on February 16, 2013 by Administrator. This entry was posted in Which Open Source Blog and tagged Hathaway, Hires, Innovative, Intrepid, John, Learning, Pioneer, Technology on February 14, 2013 by Administrator. Premier Assistive Technology announces THE ULTIMATE TALKING DICTIONARY. DeWitt, MI (PRWEB) June 13, 2003  Premier Assistive Technology, a world leader in assistive software, has announced the release of its newest product, the Ultimate Talking Dictionary, a comprehensive PC-based dictionary combined with a powerful thesaurus that actually reads the definition aloud for a user. The Ultimate Talking Dictionary contains over 250,000 words, including persons, places, slang and common phrases. Works with virtually ANY software / ease-of-use – As long as you can highlight text from any source (email, documents, webpages), definitions can be read to you WITH A SINGLE FUNCTION KEY. Clear definitions  Definitions are clear and concise and targeted for the everyday user with a full integrated thesaurus for words of similar meaning. Predictive spelling / Power Search – helps you find a word when you dont know the exact spelling or only part of the word. Words in context  Defintions also include examples of words used in sentence to give the user a more clear understanding the meaning. The Ultimate Talking Dictionary sells for only $ 29.95. You can purchase online at http://www.readingmadeeasy.com or call 815-722-5961. This entry was posted in Which Open Source Blog and tagged Announces, Assistive, DICTIONARY., Premier, Talking, Technology, Ultimate on February 13, 2013 by Administrator. Investment technology company Verdant Analysis announces a new addition to their suite of investment analysis tools. The enhancement is called Fast Exports and it allows users to download multiple financial statements into excel in a matter of seconds. The whole focus of our company is to help people make better investment decisions by revolutionizing the analysis process, says Jennifer Cameron, co-founder and CEO. It is all about finding meaning in the information that is out there. For example, financial statements have very little merit in a read-only format. You need to be able to manipulate the data, to compare and contrast it. To be useful, they have to be in a spreadsheet. Before today people generally had to do it by hand; a time-consuming, tedious and frustrating process . Now its fast and painless. The companys core product already allows users to generate financial models and ratios using specific line items, statistical measures and market information. There was a demand from our users to work with entire statements in excel, says Cameron. And although it was possible to build analysis templates to access the full statements, we designed a much more elegant solution to accomplish this particular task. In Fast Exports, users can pull the financial statements of any public company in Canada or the U.S. After entering the ticker symbol, choosing any or all of the three financial statements and the time periods, the user clicks a button to generate an excel version. The company plans to expand their selection of Fast Exports to include suites of commonly used ratios, such as liquidity or profitability ratios, and valuation models such as discounted cash flow. Verdant Analysis develops software to help people to achieve investment excellence. Various applications help users create and test their own investment theories and measure their results. The result is improved speed and quality in financial decision making. The companys powerful and intuitive applications are designed to meet the needs, including custom design needs, of serious investors performing robust analysis. The data infrastructure upon which the applications reside includes market and financial statement information, with new data streams to be incorporated soon. This entry was posted in Which Open Source Blog and tagged Analysis, Application, Company, Excel, Export, Financial, Into, Investment, Statements, Technology, Unveils, Verdant on February 13, 2013 by Administrator. Hexalock, Ltd., a leader in CD copy protection technology and digital rights management solutions, announced today that TextWord Press, Inc., publisher of the Implications of Literature high school textbook anthology series, incorporating a breakthrough in literature/language arts integration, is protecting its companion CD-ROMs from unauthorized copying and use with HexaLock Copy Protection Technology. Producing the series was a challenge! General Editor Deborah Schechter says. “We had to pass several litmus tests along the way. In addition to reinforcing inherently high moral standards, we had to satisfy rigorous NYSTL [New York State Textbook Law] requirements. Furthermore, these 900-page volumes had to be attractively designed and prove engaging to teachers and students alike. Finally, they had to prepare students at an Advanced Placement performance level to compete for entry into the best colleges and universities in the country. Ms. Schechter continued, When we prepared the companion Testbank CD-ROMS for each level of the Implications of Literature series, we were very concerned about the possible unauthorized copying and use of our intellectual property. We have found HexaLock copy protection technology to be an ideal solution to our concerns. We are pleased that TextWord Press has incorporated HexaLock CD-RX Copy Protection Solutions within its products, said John Stevens, Vice President, Business Development, HexaLock. The company joins a growing list of publishers, worldwide, who use HexaLock technology. Not only does it provide world-class copy protection, it is specifically designed to be easily integrated into publisher titles and provide a positive end-user experience. An original protected CD will open and play normally in any end-user computer. However, the user will find that the files cannot be downloaded to his, her, or any other computer’s hard drive, or copied onto another CD-ROM disc. Individual tests can be printed and Xeroxed for classroom use only by the authorized purchaser. Mr. Stevens continued, We often recommend that our Licensed Publishers add the phrase this is a copy protected CD do not copy to their CD label to inform users of this added protection. About Text Word Press, Inc.
TextWord Press emerged in response to a critical need expressed by private and parochial high school principals across America. “Give us an academically superior high school literature series that is free of material that conflicts with our values,” they urged. The result is TextWords Implications of Literature textbook series featuring content chosen for its time-tested literary quality and its classic and traditional values-oriented curriculum. HexaLock develops and markets copy protection and digital rights management solutions worldwide. Headquartered in Shefayim, Israel, HexaLock opened its US offices in 2001. HexaLock CD Copy Protection, Version 4.2, released in June 2005, offers the latest in copy protection technology for both CD-ROMs and CD-Rs, including the ability to now protect Microsoft PowerPoint documents. These innovative solutions for intellectual property protection offer content owners new and highly effective options to address their digital asset management requirements. This entry was posted in Which Open Source Blog and tagged CDROMs, Companion, Copy, HexaLock, Implications, Inc., Literature', Press, Protected, Protection, Series, Technology, TextWord on February 12, 2013 by Administrator. Promys, a leader in professional services automation software for the IT Solutions provider industry, is pleased to have been reviewed and certified by Technology Evaluation Centers (TEC). TEC helps businesses define their software requirements and then provides informed, impartial software reviews that allow companies to research evaluate and select the software system that is the best fit for their requirements more quickly and cost-effectively than using other methods. TEC provides companies in the market for new enterprise software everything they need to evaluate offerings including research, vendor data, reports, templates, and access to the TEC Advisor software selection system. The process for having TEC review our solution and certify our functionality as a fit for a specific set of business requirements is a way of formalizing the approach weve taken with customers all along. remarked John Breakey, founder and former CEO of Unis Lumin, a Cisco Gold Partner and current CEO of Promys. At Promys, we actually dont believe that a PSA solution built for a 5 person break fix shop will be just as good a fit for 40-employee IT systems integrator working on large multi-phase projects. The TEC certification allows prospective customers an objective and easy way to quantitatively see the specific differences between our solution and other vendors offerings. Most companies now initiate their PSA business software investigation and evaluations via the web and more and more companies are leveraging 3rd party independent formal PSA software reviews to help them build their short list. So, companies have come to rely on the analysts at the TEC in order to determine which PSA software vendors they should seriously evaluate based on their particular set of requirements. PROMYS PSA software is ideal for companies that have reached a size where they need more detailed and accurate revenue and resource forecasting, better visibility into mid-project profitability and they are starting to focus more on margin because thats what will fund their continued growth. The beauty of the TEC certification is that the TEC analysts reviews will be crucial in highlighting why PROMYS would be a better fit for those requirements than other vendors solutions. In conclusion, Breakey said, Going through the TEC vendor certification process was a great experience for our company. It really helped highlight where the PROMYS strengths, are as well as where we need to focus development resources if we want to continue to be a leader in our solution category. Promys professional services automation software was originally developed in 1998 to address the fundamental problem that IT solution providers face; how to tie professional services together with complex equipment solution delivery and multi-layered post sales support. In 2003, Promys was spun off as its own corporate entity. Promys quickly added customers in the IT solution provider, systems integrator and managed services marketplace, including one of the largest and most recognized technology solution providers in the world. For further information on Promys, please visit http://www.promys.com or call 1-866-728-2345. This entry was posted in Which Open Source Blog and tagged Centers, Certified, Evaluation, Promys, Reviewed, Software, Technology on February 10, 2013 by Administrator.